We are delighted to announce that Morgenländischer Glanz. 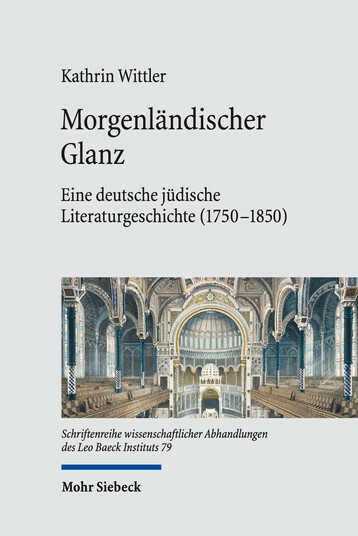 Eine deutsche jüdische Literaturgeschichte (1750–1850) by Kathrin Wittler has been published recently in the Schriftenreihe wissenschaftlicher Abhandlungen des Leo Baeck Instituts. How did Orientalism condition German Jewish writing and its reception? Kathrin Wittler reconstructs the role of literary aesthetics in the transformation of Jewish traditions between 1750 and 1850. Covering a wide array of authors from Moses Mendelssohn and Naphtali Herz Wessely to Heinrich Heine and Fanny Lewald, Kathrin Wittler investigates literary experiments with different languages and scriptural systems and with varying poetic forms and rhetorical styles. Jewish authors, the literary analysis shows, defined the realm of their poetic imagination through figures of mediation between East and West, infusing their European standpoint with the splendour of the Orient. For further information or to buy this book, please refer to Mohr Siebeck by clicking on the link below. We are delighted to announce that The Jewish Economic Elite. Making Modern Europe by Cornelia Aust has been published recently as part of our German Jewish Cultures book series. In this rich transnational history, Cornelia Aust traces Jewish Ashkenazi families as they moved across Europe and established new commercial and entrepreneurial networks as they went. Aust balances economic history with elaborate discussions of Jewish marriage patterns, women’s economic activity, and intimate family life. Following their travels from Amsterdam to Warsaw, Aust opens a multifaceted window into the lives, relationships, and changing conditions of economic activity of a new Jewish mercantile elite.